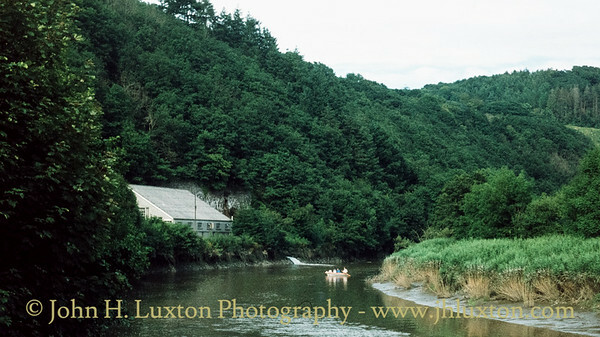 Morwellham Quay is an historic river port on the Devon bank of the River Tamar that was developed during the 19th Century to support the local mining industry. 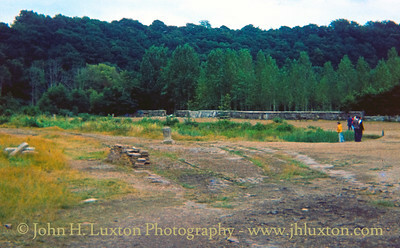 Conservation work commenced in the early 1970s when the site opened as a living history museum. Your webmaster first visited in 1976 and was a very regular visitor during the 1970s to late 1990s when most of the photographs in this gallery were taken. Though the Museum is no longer operated by a charitable trust, it remains open to the public though some of the features such as the farm are no longer accessible to visitors. In July 2006, UNESCO (the cultural arm of the United Nations) awarded World Heritage Site status to the Cornwall and West Devon Mining Landscape area. 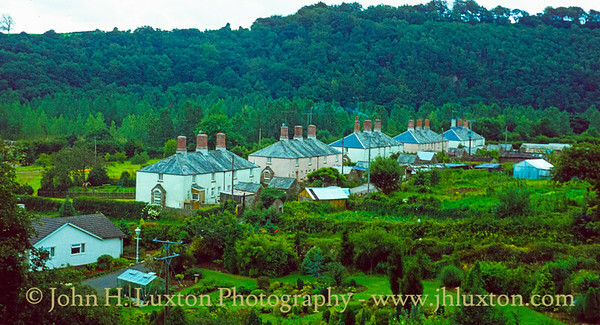 Morwellham is strategically sited at the centre of the Tamar Valley Mining District which, together with nearby Tavistock, forms the easternmost gateway area to the rest of the World Heritage Site. The industrial Heritage museum is an Anchor Point of ERIH, The European Route of Industrial Heritage. Morwellham Quay and Farm is well known from the BBC TV History Series "Edwardian Farm" which was shown in 2010 - around the time the original Museum operation encountered financial difficulties following the withdrawal of support from Devon County Council. 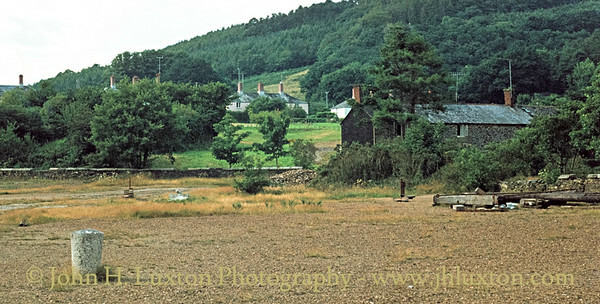 Today most of the original site is operated by the proprietors of Bicton Gardens a well known tourist attraction in east Devon, however, the farm which featured significantly in the BBC TV series no longer forms part of the museum. 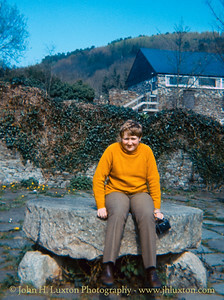 Your web master sat on the Manganese Mill grind stone. 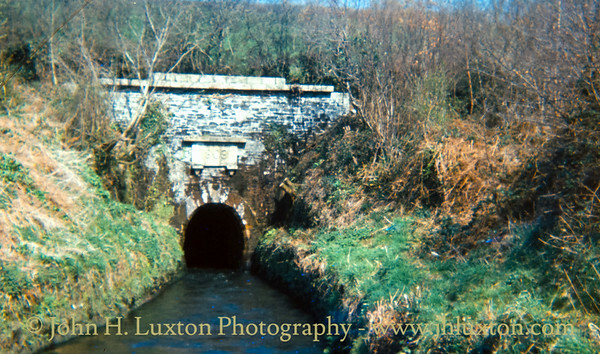 Morwell Down Tunnel - Tavistock Canal The portal of the Tavistock Canal Tunnel commenced 1803 seen in April 1976 on my first visit to Morwellham Quay. The Tavistock Canal provided a link from the Dartmoor Stannary Town of Tavistock to the River Tamar Port of Morwellham Quay. The link from the canal down to the port being effected by an incline railway.Freight having to be trans-shipped to railway wagons which were lowered down a water powered incline plane. The tunnel was excavated by noted mining engineer John Taylor work commencing in 1803 though the canal did not open in full until 1817. Whilst no longer navigable, the canal is owned and maintained by South West Water which use it to supply the Morwellham Hydro Electric Power Station. Camera: Kodak Brownie 127 Morwellham later became well known as the location of the BBC TV Edwardian Farm series. The area around Morwellham is now part of the Cornwall and West Devon "Cornish Mining" World Heritage site. 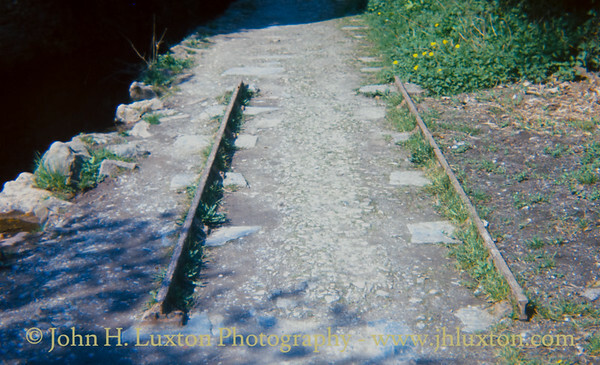 Length of railway track on the tack bed of the Tavistock Canal incline plane near the Ship Inn. The original track on this incline comprised double flanged rail for use with unflanged metal wheels. The 32 feet overshot Managese Mill Waterwheel is a centre piece of Morwellham Quay. It once powered the Managanese Mill.. The original wheel is believed to have been installed in the early 19th Century. 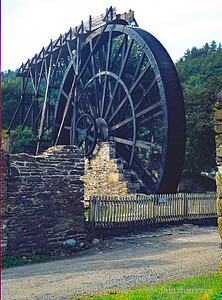 The current wheel was erected in 1975 having been recovered from a Cornish china clay works. Tavistock Canal tramway stone sleepers along side the Old (Medieval) Dock. 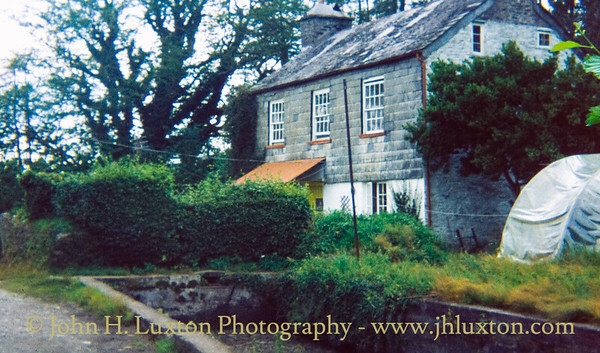 The Quay Cottage at Morwellham when it was still a private residence before its inclusion in to the museum as the Copper Ore Cottage. The waterwheel can be seen on the right. The Tavistock Canal terminal above Morwellham. Here canal boats were loaded and discharged with goods bound for and from Tavistock being transferred to and from railway wagons which were raised and lowered by the nearby incline. Unfortunately the trail for visitors was diverted away from this interesting location due I understand to the withdrawal of hospitality by the owner of the canal cottage. 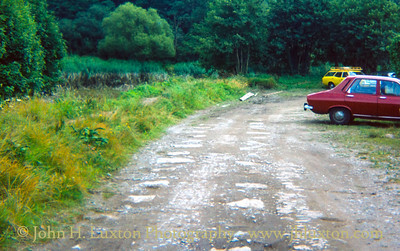 This is one of several slides taken at this location on this visit - but the only one that has survived. The others being damaged. As a result of this I wanted to replace them and decided in the 1980s to walk past the no-entry signs on the canal tow path with the intention of just taking a few quick photos. However, as I approached the basin and cottage I was intercepted by a very aggressive old man who didn't want to listen to my polite explanation of why I had ignored the no entry sign. The Devon Great Consols Great Dock before dredging and restoration work was undertaken. Stacked up can be seen some of the locally made tiles which once covered the quay floors where the Copper Ore was piled pending shipment. 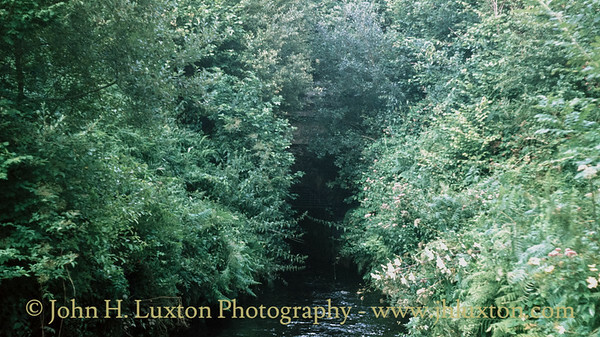 The Lime Kilns - many of the River Tamar Quays feature these structures used to burn lime for use by the local farming community as fertiliser. 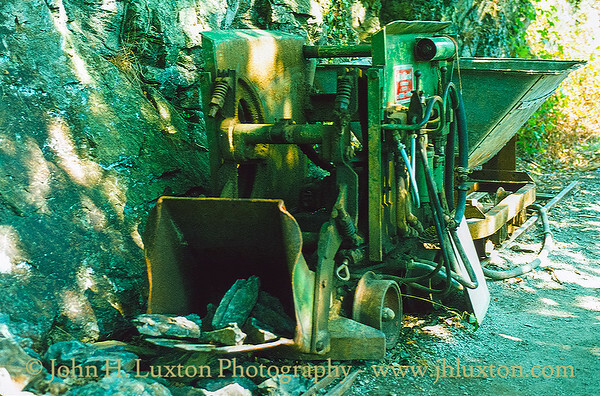 An Eimco rocker shovel used during the opening up of the George and Charlotte Mine to narrow gauge visitor trains. 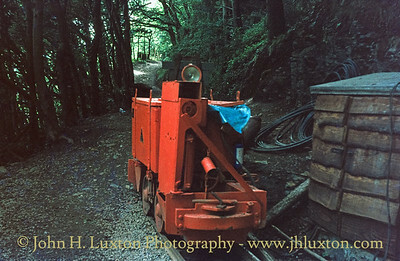 One of the engineers who developed the mine had been previously been involved in the building of the Ffestiniog Railway's new Moelwyn Tunnel. 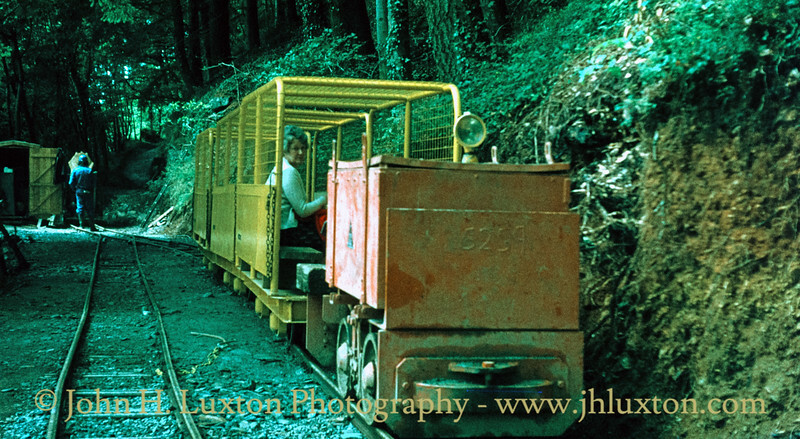 A BEV batter locomotive coupled to a train of man riding cars built by the Cornish engineering company of Holman. A train returns from the George and Charlotte Mine. 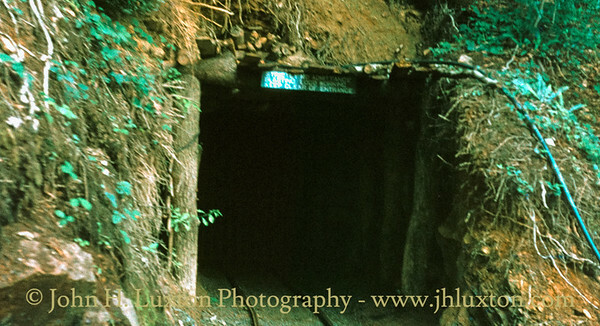 Entrance to the George and Charlotte Copper Mine believed to have been first worked in the 18th Century and closed around 1869. 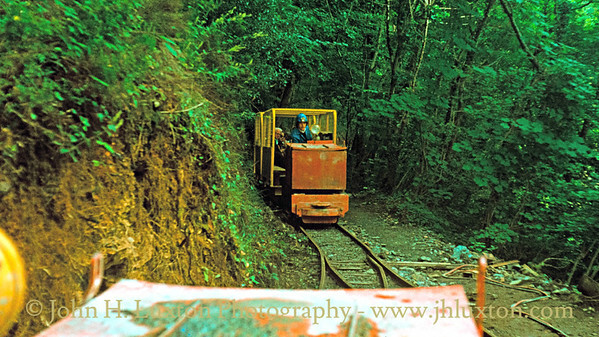 In 1978 it was reopened to visitors who travelled into the mine using modern mine railway equipment, In the 1980s the mine train experience was extended with trains leaving via another adit level near the lost rive port of Newquay thus providing a triangular trip. 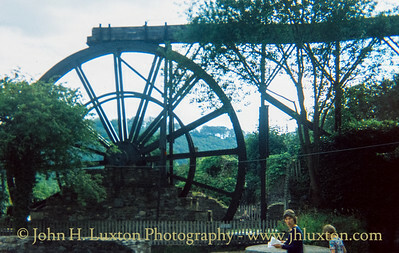 The 32 feet overshot Managese Mill Waterwheel is a centre piece of Morwellham Quay. It once powered the Managanese Mill.. The original wheel is believed to have been installed in the early 19th Century. The Bedford Cottages. Morwellham, Tavistock and much of the surrounding land was part of the Bedford Estates. The Duke Francis the 7th Duke of Bedford arranged for the building of high quality cottages at Morewellham, Tavistock and elsewhere in the area for tenants and employees. They are of quite distinctive design and are a feature of the locality. The Deveon Great Consols Great Dock before restoration. A granite mooring bollard can be seen. Just to the left of the Quay Cottage a railway tunnel emerged where the grass area can be seen - this was the Devon Great Consols Mineral Railway which provided a link to the port from Devon Great Consols Mine. The section between quayside and the top of the hill being via a powered incline. 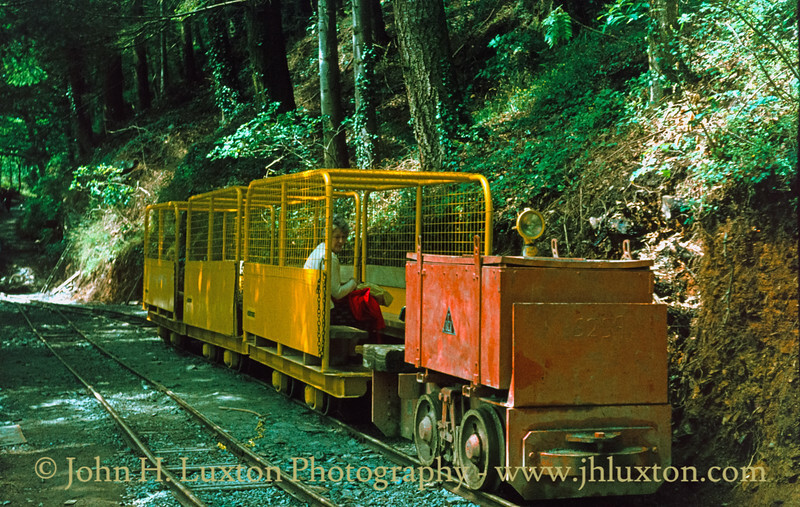 Coal and mine supplies travelling up the incline with ore coming down. 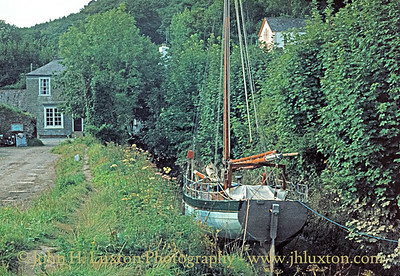 A sailing vessel in the Old (Medieval) Dock which became the Tavistock Canal Company Dock. 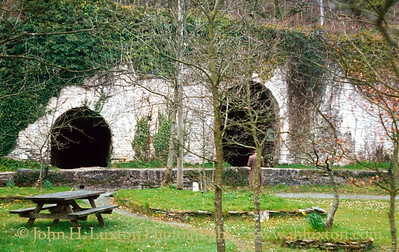 The stone sleepers of the canal tramway can be seen. 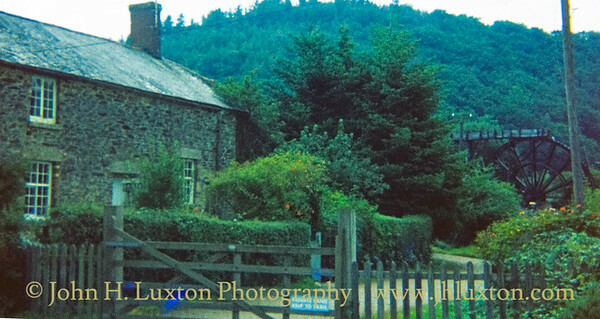 In the background can be seen the slate hung shop with the wite window frames. This was to be converted back into a replica period shop during the 1980s. A view down stream showing Morwellham Hydro Electric Power Station - then operated by the Central Electricity Generating Board. Today after passing through several owners it is operated by South West Water. The feed water is routed from the Tavistock canal. 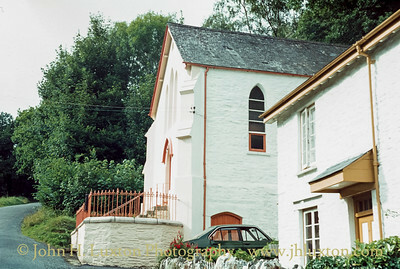 The only place of worship at Morwellham was the Methodist Chapel seen here adjoining the Minister's house, The nearest Anglican Church was around two miles away at Gulworthy. The Morwell Down Tunnel - a view taken just over three years after my previous image which gives a clear impression of the speed of growth of the vegetation in this area. George and Charlotte Mine BEV locomotive.